�During winter and spring in Yunnan, the sky is high and the air is fresh. If one pays a visit to the Dai villages in Xishuangbanna, one may frequently run into a kind of fruit tree, the fruits of which are particularly loved by the local people -- the tamarind tree. Tamarind trees are very tall; their trunks are coarse with sparse branches and leaves; and strings of bending legumen fruits are hanging on the branches. Tamarind trees are evergreen tropical and sub-tropical tall arbor trees. They have two varieties: the sweet and the sour varieties. They like hot weather, and they can grow well in places where the annual average temperature between 18(C and 24(C and the annual average rainfall is between 500mm to 1200mm. 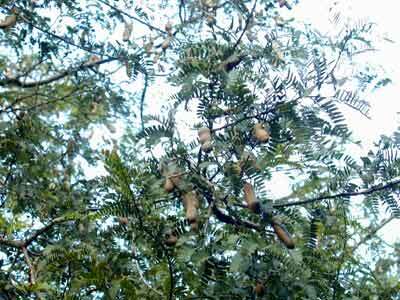 Tamarind trees originated in tropical Africa and were first introduced into India via Sudan. That is why some people often take it as something originated in India. Later tamarind trees spread to Persia, Arab countries and Europe, and in 400 B.C. they were quite popular in ancient Egypt and Greece. Among all tropical fruit trees, tamarind treed may have the wide-most distribution. Except Antarctica, people can find them in almost all other continents. Asia is a major tamarind producing area. Tamarind trees are widely planted in India and Sri Lanka as well as southeast Asian countries, and they mainly grow in dry mountain slopes where heat is sufficient, rain is less, and the elevation is not higher than 1500m. In India, Philippines and Thailand, there are large stretches of tamarind orchards, and the tamarind yields in these places are quite considerable too. India has an annual tamarind output of 275,000 tons, Philippine exports 80,000 USD worth of tamarind products each year, and Thailand also exports a lot of tamarind products every year. In America, tamarind trees mainly distribute in the dry and tropical areas of Latin America and the USA; Mexico has the most tamarind orchards in Americas, and its total tamarind planting areas amount to 4,443 hectares. In the USA, the famous Manila sweet tamarinds mainly distribute in Hawaii, places along the west pacific coast, banks along the Mexico Gulf, and Florida. Tamarinds are also found in Venezuela, a country that also possesses large areas of wild tamarind trees. In Africa, tamarind trees mainly distribute in the dry land and deserts at low elevation of Egypt, Ethiopia, South Africa, Lesotho, Kenya, Nigeria, Cameroon, and Sudan etc. South Africa and Ethiopia have relatively more tamarind trees. In Europe, tamarind trees mainly distribute in coastal slopes less than elevation 1000 m in Portugal, Spain, France, Italy and Greece. Some families like to plant tamarind trees to make their gardens more beautiful. In Oceania, tamarinds mainly distribute in Australia and Fiji etc. In China, tamarinds mainly distribute in the southern parts of Fujian, Guangdong, Guangxi, Sichuan, and Yunnan etc. as well as Hainan and Taiwan. In Yunnan, we can find tamarind trees of the two varieties are growing in the dry and hot valleys of Jinsha River, Nu River and Yuan River, and Xishuangbanna where the elevation is between 50m to 1,350m. Among all these places, the hot and dry valleys in Sichuan and Yunnan are the major tamarind producing areas in China with an annual tamarind output of 100 tons; their tamarind yield, quality and flavor are all better than those produced in other provinces. All parts of the tamarind trees are treasures to human beings because they can be used widely. Tamarinds grow slowly and their life span can be as long as 200 years with more than 100 years of economic life. In addition, they have very beautiful appearances, their leaves and branches are evergreen, so they are also ideal ornamental plants. If young tamarind trees are made into miniascapes, they are also first-rate ornaments. Tamarind flowers are big, and the florescence is long, which can last 4 to 8 months. Honey collected from tamarind flowers is a bit sour but tastes very good. Besides, tamarind flowers can also be used to make salads in western food. The pulps of tamarind fruits contain sugar, acetic acid, tartaric acid, formic acid and citric acid, and are mainly used for concocting ingredients, drinks and juices. On the Latin American and African markets, we can often see tamarind products being used as condiments. In tropical countries or regions, tamarind drinks and mixed drinks are quite popular; that is why Coca Cola Company of America also begins to study tamarind. On the world market of today, we can see ADE tamarind soda water produced by Mid-American countries, tamarind drinks made in India, and mixed tamarind drinks of tamarind and papaya, bananas and guava etc. as well as tamarind whisky made in Thailand and tamarind juice made in China etc. The local folks of Xishuangbanna like to select ripe tamarind fruits and mix them with other materials to make drinks. They would add some brown sugar to the tamarind juice, boil the mixture, and they get a tasty drink. Besides, the nosh cooked with such a mixture can also take on special flavors and stimulate the appetite. Tamarind fruits are also rich in calcium, iron, and phosphor contents, and their calcium contents rank number one among all fruits. That's why tamarind fruits are often used for medical purposes. If one has tamarind fruits frequently, he might be free from illness such as diarrhea, palsy, and paralysis. Tamarind fruits can also help to kill parasites and reduce poisoning by alcohol. Because of their medical effects, some large-sized medical shops in Britain and America all have tamarind in their codex. Besides, they import large amounts of tamarind from India, Egypt, Mexico, and Thailand each year. Only the USA imports over 90 tons of tamarind for the pharmaceutical industry each year. Tamarind is also a kind of good fodder. Some countries even use its leaves to develop sericiculture. Tamarind barks contain 7% tannin, which is often used in yarn-dyed industries. The sides of the tamarind wood are yellowish white and the core part of the wood is blackish brown. The wood is dense and hard; at the same time, it is also mothproof and endurable; therefore, it is really a good material for making superb furniture, for use in construction, and for making gunstocks etc. Tamarind seeds contain 63% starch. In Thailand, the local people grind the seeds into powders to concoct coffee. In industries, tamarind seeds can be used for yarn-dying, plastic processing and bonding of woods; and tamarind starch can also replace corn starch in industries. Today, Japan, America, Canada, and Britain all import a large amount of tamarind powders each year. Besides, the kernels of the tamarind seeds contain amber acid, thus they can be used to extract edible oil. In 1942, the scientists of India found that the kernels of tamarind seeds contain 46%-48% pectic substances, and upgrades the use of tamarind seeds to a higher level.